Guitars ( Acoustic Guitar, Bass Guitar and Electric Guitars) come in a very wide range of prices, but when it comes to instruments, in general, you get what you pay for, especially when you buy new. There's a real difference between getting a bargain and buying cheap. Under 'usual' circumstances, a used guitar can usually be purchased cheaper and has already gone through its "break-in" period. Commercially built guitars are usually mass manufactured. "Custom-made" guitars are exactly that. They are custom built and tailored to your specifications by a highly skilled guitar maker. Prices for a custom-built guitar vary considerably, depending on the skill level of the craftsperson you contract the job to, but, as a rule, they are generally quite higher than a commercially built guitar of "similar" quality. Each custom built guitar is unique and therefore hard to compare in price to a commercially built guitar. This is the part with the sound hole in the front. It is where the strumming is done, and it can vary in size. The actual size, shape, type of wood, coating, and general build of the body also affects how the guitar will "sound", whether it's a rich and warm sound, or a thin and 'twangy' sound. The body tends to be the part that also gets scratched, damaged, and generally banged-up the most. This is the long piece extending from the body and ends at the 'head' of the guitar where the 'Tuning Heads' are, also known as 'machine heads'. The strings travel from the 'Bridge' on the body, across the sound hole, along the 'Fret Board', which is attached to the front-side of the neck, and finally arriving at the tuning heads where they are wrapped around tuning posts. The tuning heads are then turned by hand, which then turns the posts, making the strings tighter or looser, thus affecting their 'tuning'. Necks tend to warp and twist if not looked after, or if the guitar is left propped against a heat source. The fret board is glued to the front of the neck. This is the part you press the strings onto to make chords or play individual notes. Because it's glued on separately, a fret board can be made of a wood that's different from the neck. When a beginner plays a guitar, initially his or her fingertips are very soft and need to be hardened. A guitar with the strings too far above the fret board, also known as having a 'high action', will cause the player's fingers to hurt so much that they are likely to put the guitar away in discouragement and possibly stop playing altogether. 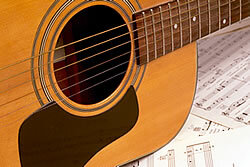 Acoustic guitar strings, come in a wide variety of 'flavors'. They can be made out of nylon, brass, steel, or a combination. Nylon strings are usually only found on Classical guitars and Student guitars, because they're easier on the fingertips. They have a rich, warm sound to them. Strings sets come in different 'weights', or sizes. Strings that come from a package marked 'Heavy' are usually quite thick in size and sound "beefy". Strings that are light, or extra light, are very thin and usually have a brighter sound to them, but are also quieter sounding than heavy strings. Check the neck/fret board for warping and twisting. You can do this by holding the guitar flat on its back, with the sound hole facing upward. Bring the guitar up to eye-level, with the neck running away from you and the edge of the body almost touching your face. Let your eyesight skim across the front of the body and down the fret board. You should be able to see if the neck is twisted or bowing. Check the 'action' of the guitar. Are the strings a fair distance from the fret board? Are they easy or hard to press down at various points on the fret board? If you are buying the guitar for yourself, and you know how to play, even if you're a beginner, then play the guitar. How does it feel? Is it easy or hard to play? Article written by Ian Williamson "Article Source: http://www.articlerich.com "